Recap. In the previous article I introduced ubercookies — techniques that websites can use to de-anonymize visitors. I discussed a recent paper that shows how to use history stealing along with social network group membership information to find the visitor’s identity, and I promised a stronger variant of the attack. 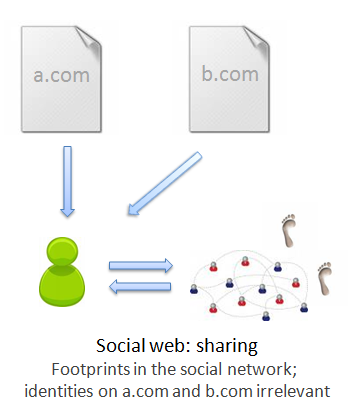 A user leaves a footprint whenever their interaction with a specific web page is recorded publicly. De-anonymization happens when the attacker can tie these footprints together into “trails” that can then be correlated with the user’s browser history. Efficiently querying the history to identify multiple points on the trail is a challenging problem to solve, but in principle de-anonymization is possible as long as the user’s actions on different web pages happen under the same identity. 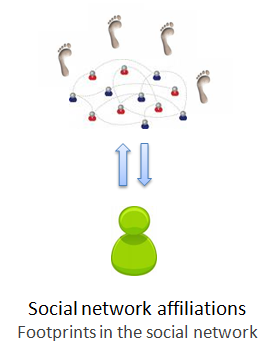 Footprints can be tied together into trails as long as all the interactions happen under the same identity. There is no need for the interactions to be on the same website. There are two major ways in which you can interact with arbitrary websites under a unified identity, both of which are defining principles of the social web. The first is federated identity, which means you can use the same identity provider wherever you go. 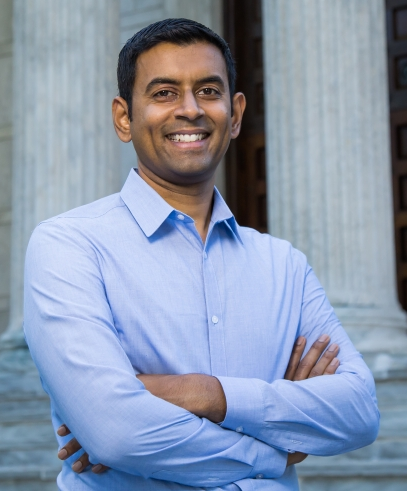 This is achieved through OpenID and similar mechanisms like Facebook Connect. The second is social sharing: whenever you find something interesting anywhere on the web, you feed it back to your social network. Now let’s examine the different types of interactions in more detail. A taxonomy of interaction on the social web. 0. The pre-social web had no social networks and no delegated identity mechanism (except for the failed attempt by Microsoft called Passport). Users created new identities on each website, authenticated via site-specific usernames and passwords to each site separately. The footprints on different sites cannot be tied together; for practical purposes there are no footprints. you almost certainly visited a URL that identifies the object before adding it. As you can imagine, these actions leave a trail. 2. 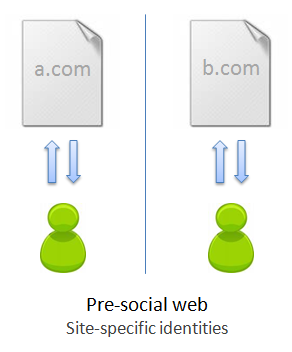 The social web: sharing. When you find a page you like — any page at all — you can import it or “share” it to your social stream, on Facebook, Twitter, Google Buzz, or a social bookmarking site like Delicious. The URL of the page is almost certainly in your history, and as long as your social stream is public, your interaction was recorded publicly. 3. 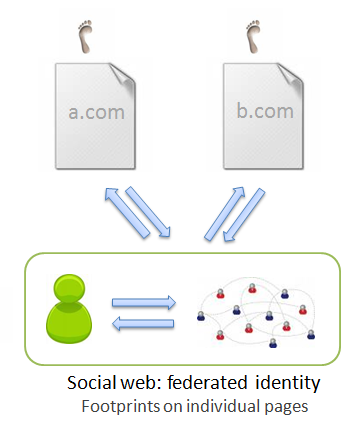 The social web: federated identity. When you’re reading a blog post or article on the social web, you can typically comment on it, “like” it, favorite it, rate it, etc. You do all this under your Facebook, Google or other unified identity. These actions are often public and when they are, your footprint is left on the page. 1. Better use of affiliation information. The Wondracek et al. paper makes use of only group membership. One natural reason to choose groups is that there are many groups that are large, with thousands of members, so it gives us a reasonably high chance that by throwing darts in the browser history we will actually hit a few groups that the user has visited. On the other hand, if we try to use the Facebook friend list, for example, hoping to find one of the user’s friends by random chance, it probably won’t work because most users have only a few hundred friends. But wait: many Twitter users have thousands or even millions of followers. These are known as “hubs” in network theory. Clearly, the attack will work for any kind of hubs that have predictable URLs, and users on Twitter have even more predictable URLs (twitter.com/username) than groups on various networks. The attack will also work using Youtube favorites (which show up by default on the user’s public profile or channel page) and whatever other types of affiliation we might choose to exploit, as long as there are “hubs” — nodes in the graph with high degree. Already we can see that many more websites are vulnerable than the authors envisaged. 2. Syndicating the social stream: my Delicious experiment. The interesting thing about the social stream is that you can syndicate the stream of interactions, rather than crawling. The reasons why syndication is much easier than crawling are more practical than theoretical. First, syndicated data is intended to be machine readable, and is therefore smaller as well as easier to parse compared to scraping web pages. Second, and more importantly, you might be to get a feed of the entire site-wide activity instead of syndicating each user’s activity stream separately. Delicious allows global syndication; Twitter plans to open this “firehose” feature to all developers soon. Another advantage of the social stream is that everything is timestamped, so you can limit yourself to recent interactions, which are more likely to be in the user’s history. Needless to say, once Twitter opens up its firehose, Twitter users (who are far more numerous than delicious users) would also be susceptible to the same technique. 3. A somewhat random walk through the history park. Identify the user’s interests by testing if they’ve visited various popular topic-specific sites. Pick one of the user’s favorite topics. Incidentally, a commenter on my previous post notes he is building exactly this capability using topic pages on Wikipedia, also with the goal of de-anonymization! Grab a list of the top blogs on the topic you picked from one of the blog directories. Query the history to see which of these blogs the user reads frequently. It is even possible to estimate the level of interest in a blogs by looking at the fraction of the top/recent posts from that blog that the user has visited. Pick a blog that the user seems to visit regularly. Look for evidence of the user leaving comments on posts. For example, on Blogger, the comment page for a post has the URL http://www.blogger.com/comment.g?blogID=<blogid>&postID=<postid&gt;. Depending on the blogging platform, you might even be able to deduce that the user responded (or intended to respond) to a specific comment. For example, On wordpress you have the pattern http://<blogname&gt;.wordpress.com/<postname>/?replytocom=<commentid>#respond. If you get lucky and find one of those patterns, that makes things even easier. If at first you don’t succeed, pick a different blog and repeat. I suspect that the most practical method would be to use a syndicated activity stream from a social network, but also to use the heuristics presented above to more efficiently search through the history. One of the least-understood developments of the last few years is the growth of databases of personal information linked to email addresses. Rapleaf is probably the leader in this field, but even Flickr lets companies search their API for users based on an email address. I ran my email address through his demo script and it is quite clear that virtually all of my online identities have been linked together. This is getting to be the norm; as a consequence, once an attacker gets any kind of handle on you, they can go “identity hopping” and find out a whole lot more about you. This is also the reason that once the attacker can make a reasonable guess at the visitor’s identity, it’s easy to verify the guess. Not only can they look for user-specific URLs in your history to confirm the guess (described in detail in the Wondracek et al. paper), but all your social streams on other sites can also be combined with your history to corroborate your identity. Up next in the Ubercookies series: So that’s pretty bad. But it’s going to get worse before it can get better :-) In the next article, I will describe an entirely different attack strategy to get at your identity by exploiting a bug in a specific identity provider’s platform. Entry filed under: Uncategorized. Tags: anonymity, de-anonymization, history stealing, privacy, social networks, ubercookies, web browsers.